COSIA’s Dan Wicklum discusses the new Carbon XPRIZE . Using technology leadership to reduce GHGs, lower costs and maintain a competitive industry. Caribou Connections Industry collaborates on solutions to caribou depredation. knowledge and expertise, drawing a clear line against policies that could cause harm to an industry already in difficult straits, while promoting policies, initiatives and approaches that encourage competitiveness on a global setting. Which is why I’d like to conclude by thanking you, our members, for continuing to support CAPP at this critical juncture. I know these are challenging times with layoffs and belt-tightening across the entire industry. I can promise that CAPP will do its part to be lean yet productive, achieving both crucial immediate value for members on the competitiveness front, while maintaining a clear eye on long-term strategic objectives such as market access, needed to keep us on a long-term growth trajectory. Finally, thanks to the staff of member companies. With the support of many member sign-ups, we’ve seen our Canada’s Energy Citizens community grow significantly. From my own time in government, I know how grassroots political action can have a powerful influence on public policy and decision-making. We clearly have momentum—let’s build on it going into 2016.
and the private sector—to come up with innovative approaches to convert carbon dioxide emissions from fossil fuels to useful products. Our second feature article focuses on how CAPP members are working collaboratively to find solutions to restore the national woodland caribou population in Canada (p. 16). Learn more about how industry, provincial and federal governments have a role to play in a broad-based solution. Also, be sure to read about the fossil fuel divestment movement and why it matters to you and your financial portfolio (p. 19). 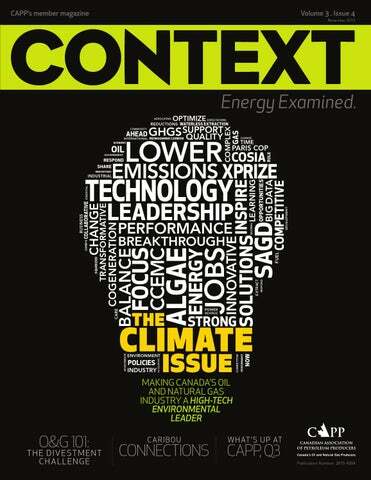 In this issue of Context, we put the profile spotlight on a Canada’s Energy Citizen, Alexander Walsh, who is on a mission to change the conversation about Canada’s oil and gas sector among today’s youth and who helped stop a nascent fossil fuel divestment movement at Trent University (p. 9). Finally, learn more about What’s Up at CAPP where you’ll find out about key deliverables in the third quarter (p. 6). Enjoy this issue of Context produced for CAPP members and share this information with employees in your organization and with your family via www.capp.ca/context. Which Pipeline Route Would You Choose? Veronica is considering two route proposals for a new pipeline to be built. Should she choose Route A or Route B? Visit http://bit.ly/1QR9s3H to view the answer. Four refineries in Sarnia and Nanticoke create local jobs while using Canadian-produced oil to supply Canadian-made petroleum products to Ontarians. 395,000 BAR R EL S PER DAY A Key Connection: Capital Markets As Canada’s leading financial centre, Ontario is a key source of investment for the capital intensive oil and natural gas industry. CAPP holds its annual investment symposium in Toronto, connecting investors with oil and gas producers. Last year’s event attracted 329 investors, with 700+ one-on-one meetings between investors and oil and gas firms. SAVE THE DATE: The 2016 investment symposium runs April 12 and 13. BIRTHPLACE OF OIL INDUSTRY North America’s first commercial oil well was drilled in 1858 by James Miller Williams, near a community in southwestern Ontario called Black Creek (the community soon renamed itself Oil Springs). Ontario has strong connections with the Canadian oil and natural gas industry. As Canada’s manufacturing heartland, Ontario companies produce equipment, supplies and services used by the industry in all the producing regions of the country. With four refineries that make up 20 per cent of Canada’s total refining capacity, Ontario is also a key downstream market, producing Canadian-made petroleum products to Ontarians. The province is also a vital market access corridor: the proposed TransCanada Energy East pipeline would cross through Ontario, allowing crude oil from Western Canada to displace foreign oil in refineries in Quebec and Atlantic Canada, as well as enabling export to destinations such as Europe, Africa and India. After a successful summer advertising campaign that inspired record engagement among Canadians, CAPP has launched phase II of its Raise Your Hand campaign: a series of TV, print and digital ads running through November and concluding on December 11. These ads target key communities in Ontario, Alberta and B.C. with positive messages on economic benefits, pipeline and marine safety and environmental innovation, while driving supporters to engage by signing up for the Canada’s Energy Citizens program at www.energycitizens.ca. View the ads at https://www.youtube.com/user/cappvideos. Q&A on CAPP’s Royalty Review Submission WITH BEN BRUNNEN, MANAGER OF FISCAL AND ECONOMIC POLICY AT CAPP. CAPP provided a submission to the Alberta government’s royalty review panel on October 26. The submission contains 60 recommendations to enhance Alberta’s current royalty system. The royalty review panel is expected to publish its recommendations in December. Context spoke with CAPP manager of fiscal and economic policy, Ben Brunnen, about the submission. economic diversification. For example, we’ve recommended the use of cogeneration and natural gas electricity fuel switching to provide baseload electrical generation in the near-term. These actions would both help diversify the economy through things like infrastructure investments, while reducing greenhouse gas emissions. Q: When the royalty review was announced, there was some negative reaction within industry. This submission, however, takes a positive approach, with recommendations that should provide value to industry. What encouraged you to take this direction? A: In working with Dave Mowat and the royalty review panel, there certainly seemed to be recognition that this is a very challenging time for industry. Also, their emphasis on “optimal returns” suggested a good understanding that it’s better to grow the pie than to try and take a larger slice of a shrinking pie. So we took this as an opportunity to make some improvements on an already good royalty system. Q: What are the next steps for CAPP on this issue? Is there anything members can do to help? A: We continue to have interactions with the panel, answering questions and so on, and I’m sure there will be questions from the government once the panel’s recommendations are released. There will be an ongoing need for education, advocacy and consultation. 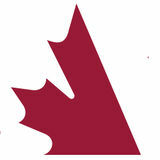 I would encourage members to continue to provide feedback to the royalty review panel at letstalkroyalties.ca. I would also encourage them to read our submission—which of course many member volunteers helped create—and if there’s something in there they especially like, that’s perhaps something they can personally champion with the panel and the government. In July, CAPP launched a program to get Albertans informed, engaged and activated on oil and gas issues, in relation to the royalties and climate change reviews. Albertans were also recruited into the Canada’s Energy Citizens (CEC) program to be an ongoing voice of industry support and engagement. To illustrate the impact of Canada’s oil and gas industry on the Alberta economy, CAPP worked with members to identify the industry supply chain—i.e., companies that produce goods and services for the oil and gas industry—within the province. Based on the previous two years’ data (2013-2014), more than 20,000 small, medium and large-sized businesses rely on the energy industry—everything from drilling contractors to safety apparel manufacturers to caterers and janitorial services. The Newfoundland and Labrador government released details of its new generic offshore oil royalty regime on November 2. CAPP had participated in a consultation with the government, emphasizing the importance of maintaining a fiscal structure that would allow the industry to remain competitive with other provinces and countries. Alexander Walsh is on a mission to change the conversation about Canada’s oil and gas sector among today’s youth. He’s already helped stop a nascent fossil fuel divestment movement at Trent University in Peterborough, Ontario. Along the way, he has enlisted a new generation of industry supporters. IN A NUTSHELL • Petroleum-based product Alexander can’t live without: His laptop because it puts the world’s information in his hands. • How he’d describe a world without oil and gas: “Cold—especially at this time of year.” • What shaped his ideology: Carl Sagan’s objective approach to science and understanding the universe. Q: Why did COSIA partner with XPRIZE? A: The XPRIZE Foundation has a track record of success in competition-based prizes. Also, both COSIA and XPRIZE are organizations focused on collaboration and innovation. So it was a natural step for the two organizations to work together. FEATURE STORY About COSIA: Canada’s Oil Sands Alliance (COSIA) is an alliance of 13 oil sands producers representing most of the country’s oil sands production. Since COSIA’s inception in 2012, member companies have shared 814 technologies and innovations worth almost $1.3 billion. Through this sharing of innovation and application of new technologies, members are able to minimize duplication of efforts and accelerate the pace of environmental performance improvement in several areas, including GHG emissions. “As a scientist, I know from experience that when you issue a challenge and encourage smart, motivated, creative people to work on that challenge, great things will happen.” term breakthroughs like carbon capture and storage. Q: S  o, why set a challenge for “reimagining carbon,” rather than reducing emissions? A: About 30 per cent of GHG emissions inherent in each barrel of oil come from production. COSIA members understand that, and they’re constantly working hard to reduce GHG emissions from production. By sponsoring the Carbon XPRIZE, they’re building on this effort and expanding the solutions base. It’s designed to take a different but complementary tack— to not just decrease emissions but to completely reimagine carbon. With the Carbon XPRIZE, we’re hoping to encourage the development of breakthrough technologies that can convert CO2 into valuable products — for example, building materials, industrial and consumer chemicals, low-carbon transportation fuels, or possibly new products altogether. Q: How does this competition build on the work of COSIA? Q: Can COSIA members participate in the new XPRIZE? A: With the type of money involved, $20 million for the competition, strong governance and adjudication are important. So COSIA member companies cannot participate in the Carbon XPRIZE. The XPRIZE Foundation is the adjudicating organization and will appoint a judging panel to evaluate the various technologies and approaches developed by teams during the competition. agreements with 38 other organizations, including governments, universities and corporations, and we are working on projects with these partners. Within COSIA, we realize we don’t have a monopoly on innovation, so we’re continually reaching out to innovators, using specific projects like the XPRIZE or through our Associate Member program. Q: Finally, now that the new XPRIZE competition has been launched, are you excited to see what results? A: Absolutely. As a scientist, I know from experience that when you issue a challenge and you encourage smart, motivated, creative people from a diversity of backgrounds and competencies to work on the challenge, great things will happen. With our commitment to the Carbon XPRIZE, COSIA’s member companies have taken the next step in finding a solution. We know, as does the XPRIZE Foundation and our co-sponsor NRG Energy, that the next great innovation can come from anyone, anywhere. FEATURE STORY Climate change is a global issue, requiring action across borders and across industries. The spotlight is clearly directed on this issue in 2015, perhaps shining more brightly than ever before as world leaders prepare to gather in Paris for the Conference of the Parties, also known as COP21. on research and development between 2009 and 2013. In Canada, government and the oil and natural gas industry share the view that we have the opportunity to be a leader in the space of greenhouse gas (GHG) emission reductions. For industry, the key to demonstrating this leadership will be through commitment to innovation and technology. The concept of innovation is nothing new in Alberta, where the province was the first in North America to legislate GHG emissions reductions for large industrial facilities. And the oil sands themselves are a testament to the power of technology and innovative thinking. The idea of being able to extract oil from sand, at an industrial scale, in a manner that is both feasible and profitable, might have seemed far-fetched 60 years ago. Ultimately, the creation of a Canadian oil sands industry required some pioneering technological innovations and monumental feats of engineering. CANADA’S OIL AND GAS INDUSTRY IS FOCUSED ON TECHNOLOGY LEADERSHIP AND INNOVATIVE THINKING TO REDUCE GHG EMISSIONS, LOWER COSTS AND MAINTAIN A COMPETITIVE INDUSTRY. This commitment comes as energy companies contend with low commodity prices and tightening budgets. However, as CAPP vice-president of oil sands and markets Greg Stringham points out, positive environmental outcomes and lower costs can be aligned goals. FEATURE STORY fuel consumption. And in situ producers have refined steam assisted gravity drainage (SAGD) technology, adding gasoline-like solvents to steam to enable bitumen to flow more easily to the surface. It’s the kind of collective effort that over time has gained momentum, so much so that Environment Canada reports that, since 1990, emissions per barrel of oil sands oil have declined by 30 per cent. The industry is constantly improving and is applying new, innovative technologies that lower emissions and cost at the same time,” Stringham says. “We developed the technology to get the oil out of the sand, and we’re just as committed to taking carbon out of the barrel.” In the quest to build leaner, more efficient operations, there are breakthroughs. Witness what’s occurred at Imperial Oil’s Kearl facility, an oil sands mining project northeast of Fort McMurray that began production over two years ago and is currently producing over 200,000 barrels of bitumen a day. In situ producers use SAGD or cyclic steam stimulation (CSS) to recover bitumen. Both forms of production involve injecting high pressure steam into deep boreholes to liquefy bitumen so it can be pumped out. Generating steam, though, is very energy intensive and leads to emissions. This has prompted the industry to research waterless extraction methods. Nsolv Corporation, for example, is testing a solvent process that uses heated solvent. The project is funded in part by the Climate Change and Emissions Management Corporation (CCEMC). “It’s a made-in-Canada patented warm solvent technology that produces oil sands in a much more economically and environmentally sustainable way than current industry technologies,” says Joseph Kuhach, Nsolv’s CEO. Nsolv’s process uses proven horizontal well technology developed for SAGD, but instead of water, injects warm propane or butane which condenses underground and dissolves the bitumen. Contaminants such as heavy metals and asphaltenes precipitate out and are left in the ground. As a result, a partially upgraded oil is produced. Because of its low pressure, low temperature operation, it requires very little energy to produce the oil. GHG emissions are reduced by up to 80 per cent, compared to SAGD methods. “Nsolv allows us to move well beyond incremental changes and help transition the industry into a much a cleaner energy source, with significant reductions in GHG emissions,” Kuhach says. After a decade of progress in the lab, in 2014, Nsolv began operating a pilot project at Suncor Energy’s Dover oil sands lease northeast of Fort McMurray. In September this year, the pilot surpassed a key milestone, producing 60,000 barrels of oil. Another project, also at the Dover site, is testing enhanced solvent extraction incorporating electromagnetic heating (ESEIEH, pronounced “easy”) technology. Backed by a consortium of Suncor, Devon Energy, Nexen, Harris Corporation and the CCEMC, the project involves inserting a radio-frequency antenna into a horizontal borehole which transmits electromagnetic energy to heat the bitumen. Once the bitumen is mobile, a solvent is injected and mixed with the bitumen to facilitate recovery. The technology processes bitumen on site to remove water and solids and improve bitumen quality. Bitumen is then blended with natural gas condensate to create a diluted product. The PFT process removes a portion of the heavy end of the barrel (asphaltenes), using less energy than would be required to remove the same heavy ends in a coker at an on-site upgrader. The consortium has been collaborating on this technology since 2011. In July, 2015, the group announced the start of a pilot project to test the technology at an in situ reservoir. “Both technologies, if successful and commercially viable, have the potential to improve economic and environmental performance in the oil sands by eliminating the need for water at in situ operations, reducing GHG emissions and decreasing our environmental footprint,” says Gary Bunio, general manager of oil sands strategic technology for Suncor. What’s notable about Kearl is a new technology that’s delivering bitumen with the wells-to-wheels greenhouse gas (GHG) emissions that are lower compared to most other heavy crudes, and nearly on par with emissions associated with the average barrel of oil refined in the United States. To achieve this level of performance, Imperial introduced a proprietary paraffinic froth treatment (PFT) technology developed by its scientists and engineers. FEATURE STORY Gallant, Imperial’s vice-president of oil sands development and research. Helping to spur more advancement is Canada’s Oil Sands Innovation Alliance (COSIA), an alliance of 13 oil sands producers who collaboratively share technological innovations related to environmental progress. Projects underway encompass everything from enhancing cogeneration engines to improving waste heat recovery, to mixing CO2 emissions with algae to produce biofuel and biomass products. “COSIA is a highly functioning collaborative effort, and it’s picking up momentum. We are going to see a lot of positive results from COSIA in the future,” says Alex Ferguson, CAPP’s vice-president of policy and performance. This focus on transformative technology has spread to others in the industry. Developers, for example, are testing waterless in situ extraction technologies that use less energy and produce fewer emissions. Rick Gallant, vice-president of oil sands development and research, Imperial Oil. advisory panel provided an opportunity for industry to recommend concrete ways to reduce GHG emissions, while promoting industry’s vision of technology leadership. In October, CAPP submitted a set of recommendations to the panel calling for the Alberta government to set a target for technology investment over the next decade as part of its climate change goals. Funds from Alberta’s emissions levy doubled to $30 a tonne by 2017, would, for example, be invested to develop and deploy new emission-reducing technologies that could have broader economic and environmental consequences. For McMillan, adopting this kind of investment is fundamental to accelerating technological leadership on climate change without sacrificing economic goals. “It shouldn’t be a choice between jobs and climate. Through technology we can unlock the value of Canada’s oil and gas resources while continuing to reduce emissions,” McMillan says. Alberta can become a stronger leader in the fight against climate change and a more competitive place to invest in oil and gas if the province strikes the right balance in its future climate policy. That’s the message CAPP stressed in its submission to Alberta’s climate change advisory panel. Context spoke with CAPP vice-president of policy and performance Alex Ferguson to learn more about CAPP’s submission. recommended improving the way the fund is structured so it becomes more effective in funding technologies that can deliver significant emissions reductions over the long term. We’re also recommending the development of an incremental clean infrastructure royalty credit program. Such a program would encourage adoption of technologies that reduce the emissions impact of oil and gas development while protecting our industry’s competitiveness. Q: What are some opportunities CAPP has identified where industry can take leadership to reduce GHG emissions? A: We’re proposing some nearterm opportunities for action. The Facts On: Oil Sands and The Facts On: Natural Gas are CAPP’s two most popular publications. These pocket-sized resources come packed with straightforward, accessibly presented information including how oil sands and natural gas resources are produced, their economic benefits, and their environmental impacts and mitigation. They have everything you need to have a rousing debate with friends, or be confidently knowledgeable in your industry. Download at http://bit.ly/1OSTmHw (natural gas) and http://bit.ly/1NefhbQ (oil sands); contact publications@capp.ca to order hardcopies. CANADA’S ENERGY CITIZENS: You Really Like Us! >18,000 Since the beginning of the year, the Canada’s Energy Citizens Facebook page has grown from 5,000 to more than 18,000 likes. Student ambassadors at the University of Ottawa recruit industry supporters to the CEC community. CARIBOU AT RISK Woodland caribou populations are listed as threatened under the federal Species at Risk Act (SARA). One of the reasons for their decline has been attributed to seismic lines from 20 or more years ago, cut through the forest to explore the underlying geology of the Western Canadian Sedimentary Basin. Low-Impact Seismic Wide, linear seismic lines are a legacy to an earlier time. Nowadays, companies use lowimpact seismic exploration where cut lines are much narrower and intentionally meander (i.e., they’re non-linear). Forest regrowth is faster and studies have shown that large mammals don’t use these lines very much. FEATURE STORY The corridors serve to concentrate predator-prey interactions as wolves and bears learn to use them to hunt more efficiently, thereby supporting increases to predator populations. Cenovus began with small-scale trials in 2008 testing theories about restoring forest cover, such as planting seedlings on mounds to protect the young trees from invasive grasses and wet soil conditions. The results from LiDea and earlier trials suggest that once restored, fewer large mammals use the lines as travel corridors. As well, growth and survival of planted trees are enhanced. Amit Saxena, supervisor of biodiversity and land stewardship at Devon and chair of the COSIA Caribou Working Group. “There’s an opportunity for some immense partnerships—between industry, Aboriginal groups, stakeholders and government to do some fruitful things.” Cenovus also experimented with forest stand modification—which involves bending tree stems from the adjacent forest across the seismic line. This is done to create physical barriers and reduce sightlines along the corridor. The trees remain alive, and provide physical structure while dropping seed into the corridor, further promoting regrowth along the line. When early trials provided positive results, Cenovus moved forward with the Linear Deactivation project (LiDea) in 2012. LiDea applied these techniques within 38,000 hectares of habitat in the Cold Lake caribou range. Woodland caribou are poorly equipped to handle this changing dynamic. Their primary survival mechanism is to space themselves away from predators. Without this spacing, caribou, and in particular, caribou calves are susceptible to high levels of predation. vice-president of Western Canada operations at CAPP. FEATURE STORY instigated species-saving measures for the sage grouse, whooping crane and Arabian oryx. Saxena notes that industry will use the workshop to examine population augmentation techniques like captive breeding and maternal penning, both from an effectiveness perspective, as well as their acceptance among key stakeholders including local communities and First Nations groups. Michael Cody, senior advisor for land and biodiversity at Cenovus. 51 ranges across Canada 34,000: national population There are 5 caribou ranges in B.C. and 12 in Alberta. COLLABORATION IS KEY Both LiDea and Algar are examples of large-scale habitat restoration projects where companies have shown a willingness to go beyond the confines of their immediate lease areas. The hope is that these projects can provide a foundation for more initiatives and partnerships involving multiple stakeholder groups across the region. “We look forward to other opportunities to collaborate on restoration projects,” notes Cody, who adds that work has begun on a 2016 proposal for a second project called the South LiDea restoration area, involving Canadian Natural and Imperial as partners. “Industry has to be involved in a viable, working landscape approach to solve the problem.” Saxena is excited by this kind of collaborative engagement. “There’s an opportunity for some immense partnerships—between industry, Aboriginal groups, stakeholders and government to do some fruitful things.” An example of a partnership that cuts across industry and geographic boundaries is the Regional Industry Caribou Collaboration, (RICC). RICC was initiated in 2013 as a partnership to work on caribou issues across two caribou ranges: Cold Lake and East Side Athabasca Range (ESAR). RICC partners include oil sands companies Devon, Cenovus, Canadian Natural, Imperial and MEG Energy; as well as TransCanada Pipelines and Alberta-Pacific Forestry Industries. The group works closely with academia, the Government of Alberta and the Alberta Biodiversity Monitoring Institute Caribou Monitoring Unit. Oil and Gas 101: THE DIVESTMENT CHALLENGE What is the Fossil Fuel Divestment Movement? The fossil fuel divestment movement is an attempt to convince groups such as wealthy individuals, universities and major pension funds to divest themselves of financial assets in companies involved in fossil fuel extraction. It is being promoted by some environmental NGOs as a means to combat climate change. In Canada, 19 universities currently have a student-led divestment campaign. To date, only Concordia University has begun divestment of about $5 million from their portfolio. Some universities will be voting on divestment motions in upcoming months, and others have already rejected the idea, citing the benefit to students and all Canadians created by the energy industry. THE ECONOMIC IMPACT OF DIVESTMENT: UNIVERSITY OF CHICAGO STUDY A study performed by Daniel Fischel (2015) of the University of Chicago Law School compared two hypothetical investment portfolios over a 50-year period: one that included energy-related stocks and one that did not. The University of Chicago study found divested portfolios performed more poorly. Meanwhile, there was no evidence of financial impact on companies targeted by divestment. NON-DIVESTED DIVESTED VS PORTFOLIO PORTFOLIO Performed 0.7% worse per year over 50 years Given that there are about $456 billion in total university endowment assets, this translates into a $3.2 billion loss per year. Another $220 million would be lost in additional management fees resulting from the extra complexity of managing funds to comply with divestment policies. 1 COUNTER-PRODUCTIVE: Many companies in the oil and gas industry are driving innovation in the very areas highlighted by some divestment groups as the reason not to invest in them. 2 STATE OWNERSHIP: Eighty per cent of the world’s oil supply is controlled by government-owned oil companies who don’t rely on publicly traded shares, and often don’t face the same requirements for transparency and environmental performance that public corporations do. The International Energy Agency estimates that global energy demand will grow 32 per cent by 2040. Fossil fuels are expected to continue supplying the majority of the world’s energy needs.